We meet on the fourth Wednesday of every month in church (19.00 – 20.00) to discuss Bible passages we have been reading. 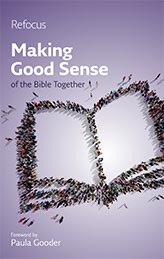 We have just started a new series of study using the Bible Society’s book ‘Making Good Sense of the Bible Together’. Our next meeting is on Wednesday 24 April 2019 – 19.00 in the church. If you’d like to come along we will provide you with a copy of the course book free of charge. We have people at all stages in their journey of faith in our group. There are no qualifications to join and you don’t need to know anything about the Bible. You just need a willingness to listen to different points of view, to learn from what others might say and (if you want to) to contribute your own ideas and ask questions. None of us know all the answers but we are interested in trying to learn more of what the Bible has to say to us now. If you’d like to join in just turn up – no need to let us know you’re coming.